Spaghetti Squash Lasagna is the perfect example of healthy comfort food. Cheesy and saucy, yet mostly squash. Spaghetti squash is a winter squash. When roasted, spaghetti squash separates into thin strands similar to spaghetti noodles. When I am craving baked pasta, but I want to be healthy, this is what I turn to. Trust me. Once you try it, you will be hooked. This recipe serves two, but it can easily be doubled or quadrupled to serve a larger crowd. These individual casseroles are perfectly portion controlled. They’re great to prepare on a weeknight, yet elegant enough to serve at a dinner party. Combine with a nice salad and crusty bread, and the result is a wonderful and comforting meal. If you would like to add a layer of Italian sausage, who’s stopping you? Get creative! This recipe is easily adaptable. Preheat oven to 375°. Cut the squash in half lengthwise. Scoop out the seeds and fibers with a spoon. (Hint: I like to use an ice cream scooper.) Place squash on a baking sheet cut side up and sprinkle with salt and pepper. Bake at 375° for 45 minutes – 1 hour. Remove from oven and let cool for 10 minutes. Using a fork, scrape out the flesh of the squash. It will separate into spaghetti like strands. Reserve squash. Combine ricotta cheese, parmesan cheese, garlic, basil, parsley, and spices. 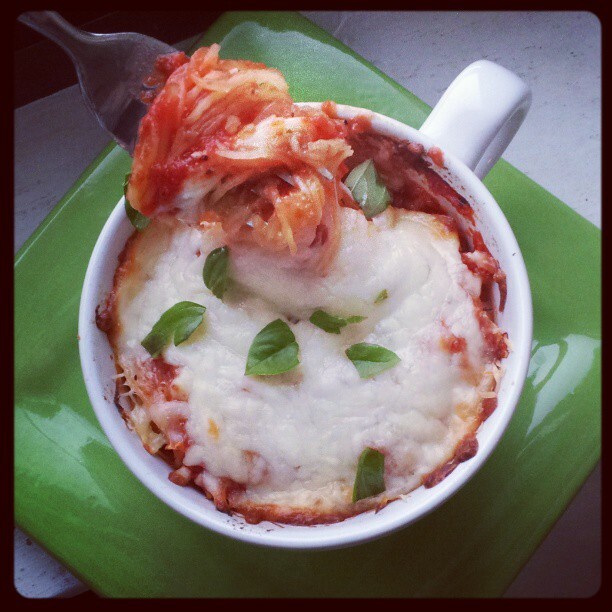 In 2 individual oven safe baking dishes, ladle 1/4 cup marinara sauce as the bottom layer. Next, add 1 cup of cooked spaghetti squash, 1/8 cup ricotta mixture, and 1/4 cup mozzarella. Repeat, ending with mozzarella. Cover with foil and bake for 25 minutes. Uncover and cook an additional 5 minutes until bubbly and golden brown. Top with additional parmesan cheese and fresh torn basil. Great idea! Never thought to replace pasta with spaghetti squash. That looks absolutely delicious. You must be a great cook!